Here are some of the Streetball dunks you can use in official basketball game. You can also read the tutorials of these dunks here. 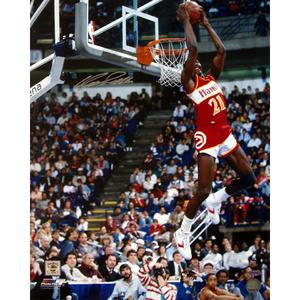 The picture demonstrating this dunk is Dominique Wilkins of the Atlanta Hawks. Throw the basketball at the backboard so it rebounds to about three feet above your head. 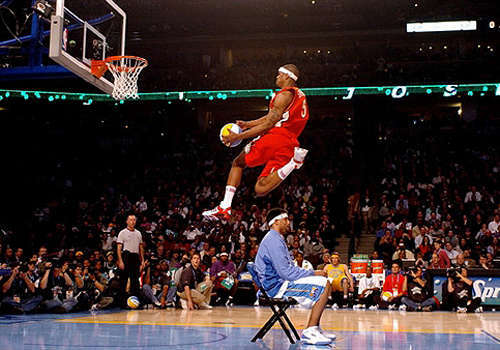 Jump and do a 180-degree twist, then catch the basketball with both hands. You should be in the air and facing away from the basket at this point. 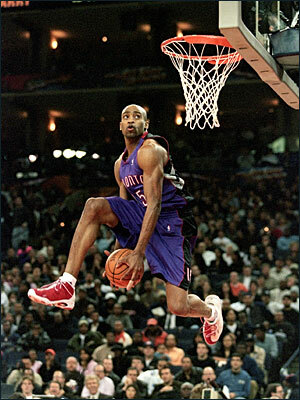 Finish off by doing a reverse dunk with both hands on the basketball. Also known as a reverse crossover dunk. Run up, parallel to the backboard, and jump under the basket with the ball in your right hand. Put the ball through your legs to your left hand. At this point you should be in the air, facing away from the basket, with the ball in your left hand. 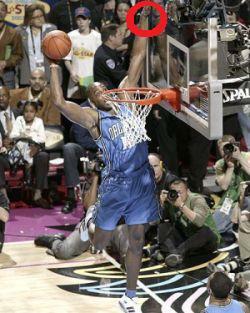 Finish off by doing a reverse dunk with the ball in both hands or just your left hand. Finishing off by slamming the ball through the hoop. There is no tutorial for this one, but it deserves a mention. This is Dwight Howard, winner of the 2008 slam dunk contest. Now, the amazing thing about this dunk is that you see where his top hand is touching the backboard (highlighted with a red circle). well that hand is 12 foot 6 inches off of the floor. That is about the height of over two fully grown adult males. That is insanely high! You need good quadreceps and calf muscles. Alternatively, you could just start routinely jogging or cycling. Then aim to be able to touch the metal rim of the basket. But it is worth it, it looks great, and makes you look like a hero. This move was officially created by Sweet Sugar Dunkington. Dunk or lay-up the ball through the hoop.